I ordered this one at the same time as Gobsmacked. Trustafarian is another one of the new fall 2012 colors, and one of the two holographic polishes in the collection. 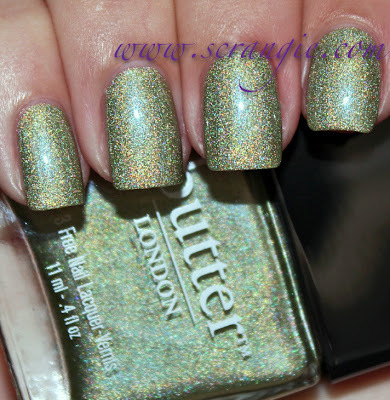 The other holo is Dodgy Barnett, a silver/grey color that claims to be "highly holographic." 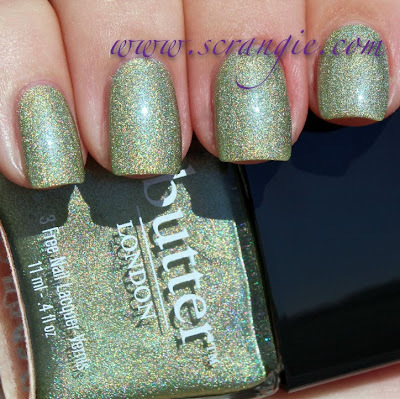 I chose this one over Dodgy Barnett just because I have a ton of silver holos already, but not many sage green ones. 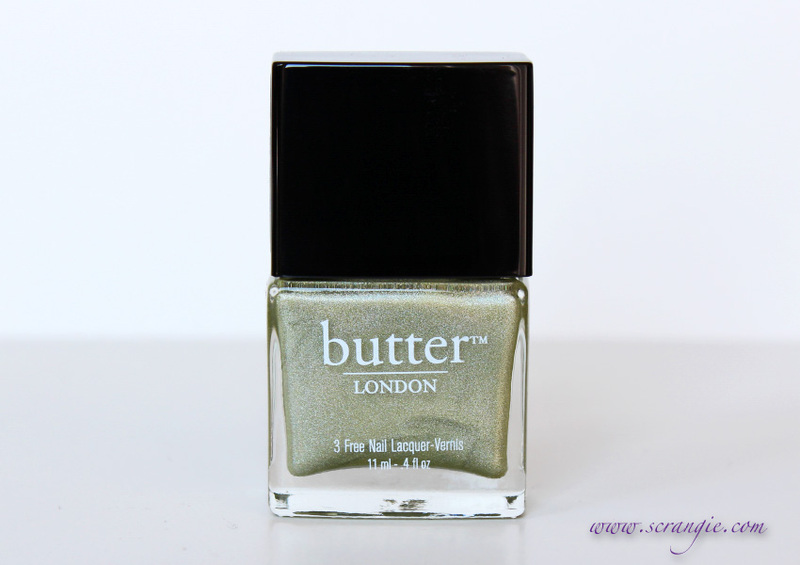 Butter London Trustafarian. This is a sage green, just not exactly the unique shade of sage I was expecting. Trustafarian is light, soft and dusty. It gives me severe lobster hands and is really very unflattering on my skintone. It has a scattered holographic finish with particles smaller than the Layla Hologram Effects, but larger than the China Glaze OMG holos. This is how it looks indoors. This is how it looks in sunlight. This is how it looks with flash. The formula on this was good but sheer. It's thin and loose-textured and tended to run and streak if I didn't take my time to apply it very slowly and steadily. It's not as streaky as a lot of holographic polishes tend to be, but I still achieved a better result by waiting for each coat to fully dry before applying the next. I used four coats here and it needed all four. Like I mentioned, it's pretty sheer. Dry time is fast. Overall, not impressed. 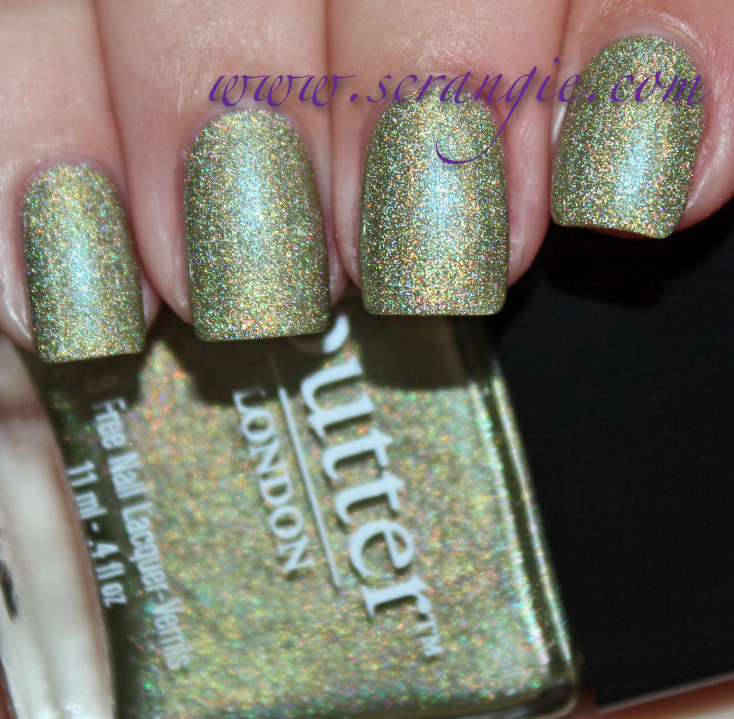 I love holos, but this particular shade of green looks awful on my skintone. I generally don't mind wearing unflattering colors as long as they're really awesome, but the holographic effect isn't strong enough to make up for the lobster hands it gives me. I think for now I'll stick with Layla Jade Groove for when I get the urge to wear a light green holo. 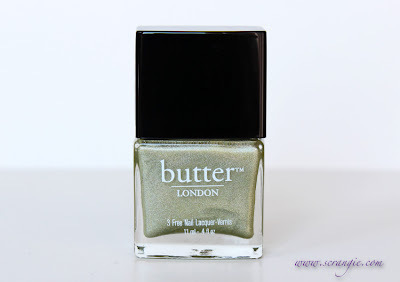 Butter London Trustafarian is available online and in-store at Ulta (which is where I ordered mine from). $14 for 0.4 oz. Saaaad face that it gives you lobster hands! Now I know not to get it, though (your skintone is similar to mine). Also, you have to be a totally sweet jelly or a duochrome Nail Prism for me to tolerate applying four coats. Wow, great swatches! Now I have to find a way to get this polish.. I love the color, even indoors without any rainbows. This one is absolutely gorgeous! It reminds me of Milani Hi-Tech. Really pretty color but four coats is just too much for me! I think it is gorgeous!! I've debated buying this colour so many times, so I'm actually glad you don't like it. 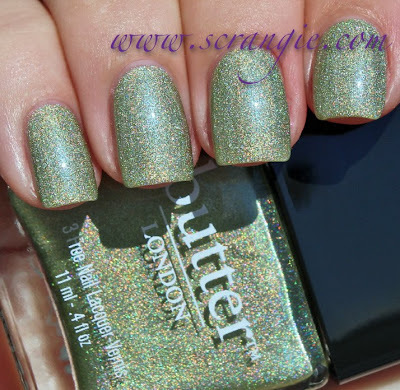 I think BL is expensive for the quality, but I do love those green holos. I'm going to resist, you've saved me some money to spend on the new China Glaze holos, if they are nice!